A Delight to the Senses - Brasserie Pamika - Shut up and eat. I love spicy food; the spicier the better. But I have my limits. I can get down with a spicy Szechuan spicy poached fish with dried chilis and tongue-numbing peppercorns or a head-sweat inducing lamb vindaloo, but I draw the line at novelty chili pepper eating competitions. I like the flavor of chilis and how they work with a dish. Once you’ve gotten used to and can get past the heat of hot peppers, there is another level of flavors waiting for you on the other side of that fiery wall. In all fairness, there are dishes that will amp up the heat for spiciness sake, but then there are cuisines that use chilis and “heat” as a way to compliment and bring out inherent flavors of the dish. A great example of this is Thai cuisine. 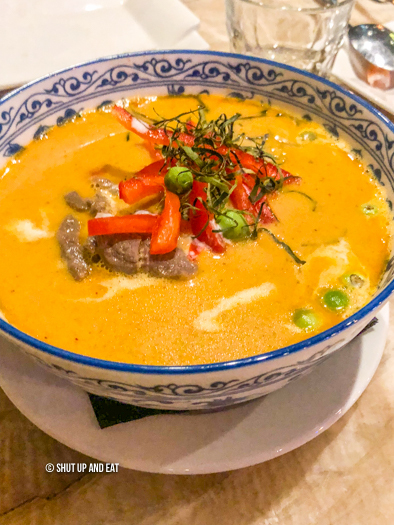 I was recently invited to check out Brasserie Thai Pamika‘s menu to explore their take on Thai cuisine. 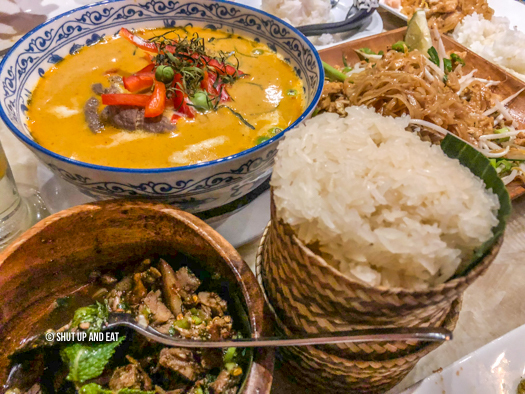 We know Thai food to be mysterious, dishes spiked with interesting exotic ingredients like fish sauce and fermented shrimp paste and botanical aromatics. But Thai cuisine is so much deeper than that. It’s also known to be a cuisine who’s dishes are a clinic in sensory exploration and perfect flavor combinations – using sweet, salty, sour and bitter in perfect harmony. 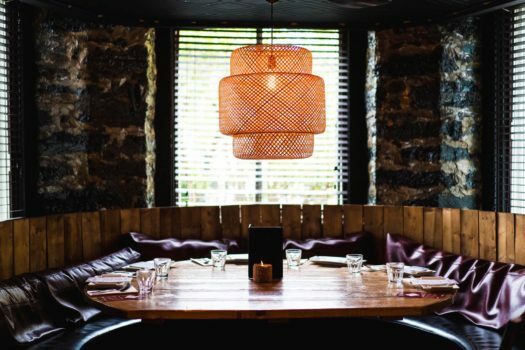 Chef Pamika’s menu (the restaurant is named after her), specializes in classic dishes with some region specialties peppered in. We were excited to explore what this spot has to offer. We started with the seafood tom kha. Incredibly aromatic coconut milk soup piqued with lemongrass and galangal. Large plump shrimps, tender squid and mussels in every addictive spoonful. Perfectly sweet and sour. 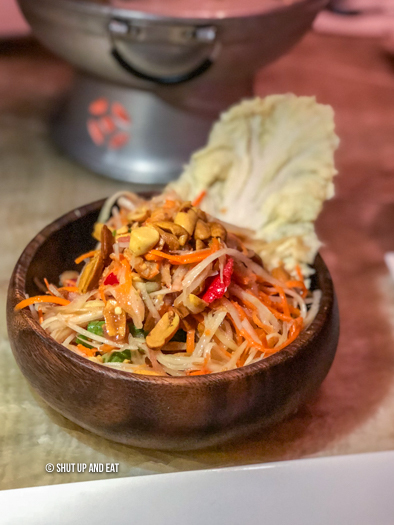 The issan papaya salad was a small and powerfully refreshing dish of shredded green papaya, carrots, fresh chilies, salted crab and “funk“. 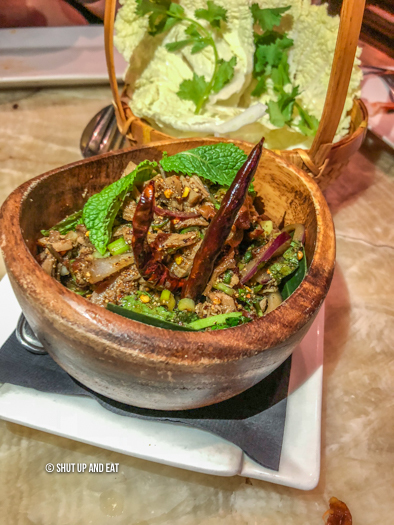 It’s not usually listed on many menus but “funk” is often the secret ingredient that makes all Thai dishes taste good. The mix of fish sauce, citrus, salted and fermented things is the secret to Thai umami – the salted preserved whole shrimp in this case. Amazing. Pamika’s roasted duck salad. It was the kind of heat that took time to build. Great combination of flavors; deep robust savouriness of the smokey duck with bright citrus undertones and bitter Napa cabbage leaves (that was used as an edible spoon.) I love spicy Asian food. I feel that the chili peppers in Asian food are used not only for heat sake, but to compliment the food. The spiciness level in this dish was off the scale. It burned. It hurt so good. The beef panaeng with flank steak, red peppers, pea eggplant and Thai Basil garnished with a chiffonade of lime leaves. This spicy red curry is thick and sweet, heavy in coconut milk with hints of peanuts. Creamy, soup-like gravy, order extra sticky rice for this one, or in my case, a simple straw worked as well. I would have liked the curry to be thicker, regardless, you’ll find yourself downing the sauce like it was soup. Go ahead, no one will judge you. 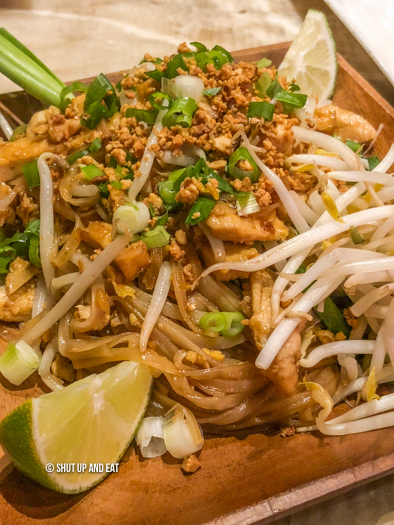 Classic Pad Thai. Rice noodles, chicken, tofu, chives, bean sprouts, topped with scallions and crushed peanuts. Perfectly chewy noodles with a generous portion of chicken, each mouthful was a delight. Pamika’s Pad Thai was a bit sweeter than I’m used to but it was delicious nonetheless. For dessert we had the pandan creme caramel. 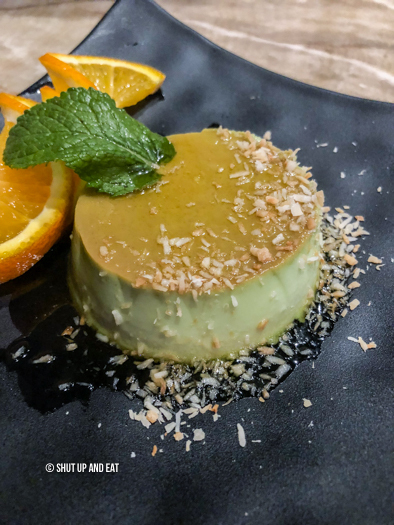 Mildly sweet, the aromatic pandan came through and was complimented by the toasted coconut shavings and custard. The sweetness was subtle, exactly the way it should be. After an amazing Thai meal that was a relentless assault of flavour explosions, a delicate dessert is a great contrast and compliment. The use of chili peppers in the menu at Brasserie Pamika is thoughtful and purposeful. All the dishes were balanced in flavor, sweet, salty, sour and bitter all in the same bite – classic characteristic of Thai cuisine. The menu here is not specific to one particular region in Thailand – more than it offers Thai cuisine’s greatest hits with their own spin on these dishes. From curries, to stir fried dishes, Thai dumplings to lab (that duck salad! ), Pamika does it all, and does it incredibly well. I was an invited guest of Brasserie Pamika. Thoughts and opinions are my own.